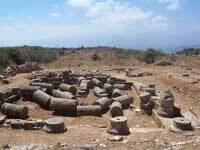 Aptera is a site in western Crete, a kilometer inland from the southern shore of Souda Bay, about 13 kilometers east of Chania in the municipality of Akrotiri. 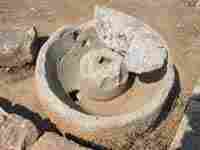 It is mentioned (A-pa-ta-wa) in Linear B tablets from the 14th-13th centuries BC. With its highly fortunate geographical situation, the city-state was powerful from Minoan through Hellenistic times, when it gradually declined. It was destroyed by earthquake during the 7th century. By the 12th century, a monastery of St. John Theologos had been built on the site; it continued in operation until 1964. 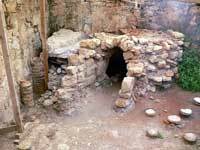 The site is now maintained by the Greek Ministry of Culture, Department of Antiquities. The hilltop, about 150 meters above the sea, commands views of Souda Bay and the Akrotiri Peninsula to the north, the Lefka Ori (White Mountains) to the south, and Kalives and the Turkish Itzendin Castle to the east; the city of Chania is not quite visible to the west. There are several structures within the square monastery enclosure, including a chapel and a two-story block of monks' cells. 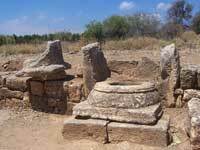 The surrounding site is notable for a two-part temple from the 5th century BC, a large three-vaulted Roman cistern, Roman baths, and parts of several Doric temples. 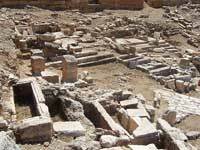 An ancient theater and a Roman peristyle villa have also been discovered on the site. 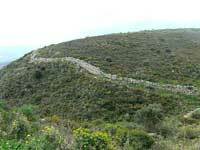 In the third century BC Aptera was at war with Kydonia, a prominent ancient city on northwestern Crete. 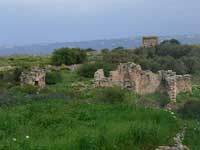 In much of the Greek Archaic Period, Aptera was under the control of Kydonia. ^ Most information in this paragraph is taken from the Ministry of Culture's informational sign at the site.